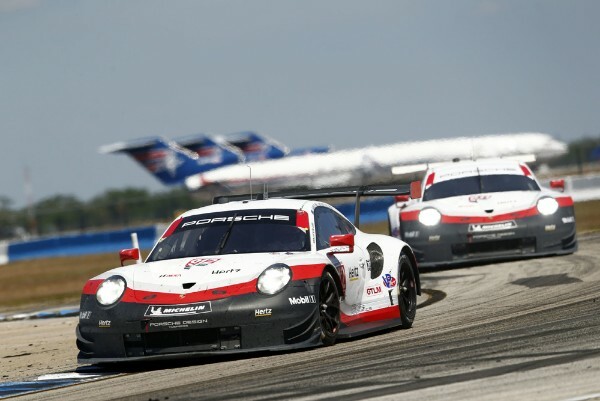 At the 12 Hours of Sebring, round two on the IMSA SportsCar Championship and the North American Endurance Cup calendar, the two 911 RSR racers fielded by the Porsche GT Team have completed the first half of the race without any problems. In the #911 cockpit, Patrick Pilet (France), Nick Tandy (Great Britain) and Frédéric Makowiecki (France) are fighting for the lead against four other automobile manufacturers in the famously cutthroat GTLM class. After 163 laps on the 5.954-kilometre Sebring International Raceway, they currently rank third, only four seconds behind the leaders. Their teammates Earl Bamber (New Zealand), Laurens Vanthoor (Belgium) and Gianmaria Bruni (Italy) sit fourth at halftime on the notoriously bumpy airfield circuit in Florida. In glorious spring weather, a total of 43 vehicles took up the 66th running of the endurance classic in Florida on Saturday at 10.40 hrs local time (15:40 hrs CET). With 18 overall victories and 70 class wins, Porsche is the most successful manufacturer in the history of the race. The latest race standings are available on http://www.livescoring.us. The live broadcast of the race outside the USA can be viewed on http://www.imsa.com.